KleenWater replacement cartridges for Cuno Water Factory FM-3 DWS 350. This complete set includes Qty (1) KWPSQC-1 sediment removal filter, Qty (1) KWPSQC-4 carbon block filters and Qty (1) KWPSQC-6 lead removal water filter. 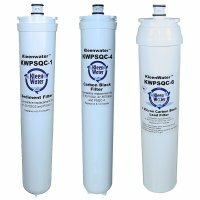 The KWPSQC-1 filter cartridge by KleenWater cartridge is manufactured of 100% FDA compliant polypropylene sediment filtration media. This cartridge will trap sediment down to 5 microns. The second filter cartridge is series is the KleenWater KWPSQC-4 carbon block filter cartridge. This filter cartridge will remove chemicals, chlorine and other contaminants that can impart an adverse taste and odor. The last filter cartridge in series is the KWPSQC-6. 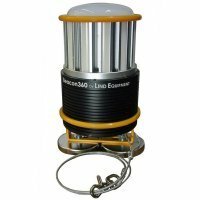 This filter employs a 1 micron carbon block capable of removing cysts as well as chlorine and chemicals. ATS (amorphous titanium silicate) is embedded into the carbon block matrix which allows the KWPSQC-6 to remove lead for 1,500 gallons at a flow rate of 0.75 gallon per minute. The above replacement filtration kit replaces 3M Water Factory filter cartridge model numbers 47-55711G2, 447-55707G2, 47-55711CM and 47-55707CM. Please note that 3M owns the Water Factory brand and has elected to phase out the entire Water Factory product line. We accept Visa, MasterCard, American Express, Discover and PayPal payment options through our secure checkout. $6.95 flat rate shipping per order unless otherwise noted (ie FREE SHIPPING). Contiguous U.S. Shipping Only. For Purchase Orders, please call PAVEL WATER FILTRATION at 877-553-3698.